After the excess of Christmas and the new year, we thought that it might be good to look at a few ways to enjoy Nelly during dry January. 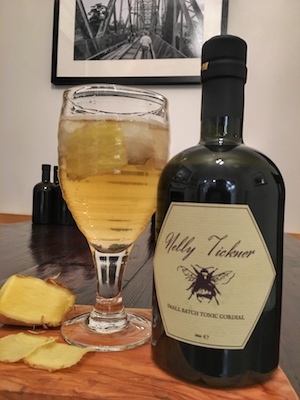 We have found that Nelly Tickner tonic cordial has proved just as popular amongst non-drinkers as it is with cocktail lovers, after all it is sweetened with low GI agave syrup, uses natural ingredients and has a great flavour, so why not! Nelly can be used as a great, and often healthier, alternative to regular soft drinks. As such, I took a bottle along to a party recently and tested out some alcohol-free drinks with the non-drinking guests. Top up with soda water to taste. Give it a stir, and garnish with a slice of ginger. You should get a slightly opaque champagne coloured drink. Very refreshing, with a dry kick. Ginger beer and Nelly Tickner, went down very well indeed! We came across a bottle of sparkling ginger refresher from Waitrose. It is basically a posh ginger beer made with mineral water and ginger extract. Adding a shot of Nelly to a ginger beer rounds off the flavour nicely without losing that warmness in the throat that you get from ginger beer. Serve with ice and garnish with a slice of apple. Really tasty! The spices and lemongrass enhance any mulled drink. An alcohol-free alternative to Nelly mulled cider. Because Nelly contains all the spices and flavours you would normally add to a mulled wine or cider, you don't need to add much else. Simply warm up some apple juice in a pan, add some Nelly Tickner tonic cordial and cloves. Simmer and serve with a dried orange slice. 1 part Nelly to 10 parts apple juice. As the weather has become more wintery, I find myself having a mug of hot Nelly of an evening. Put a single shot of Nelly Tickner tonic cordial into a mug and top up with boiling water. The agave soothes the throat, and the cinchona has a great relaxing quality to it. If you have a cold, this can be very therapeutic and a great ready-made alternative to honey and lemon. Blogging with a mug of hot Nelly.